I’m sorry about your husband’s health issues but am glad to hear that things are settling down a bit. Meghan’s new vases are lovely and perfect for today’s contents. Although our temperatures are much warmer than yours (brr, that’s cold!) our daphne odora hasn’t started opening it’s buds yet. Glad to see you back. Thank you kindly Peter. 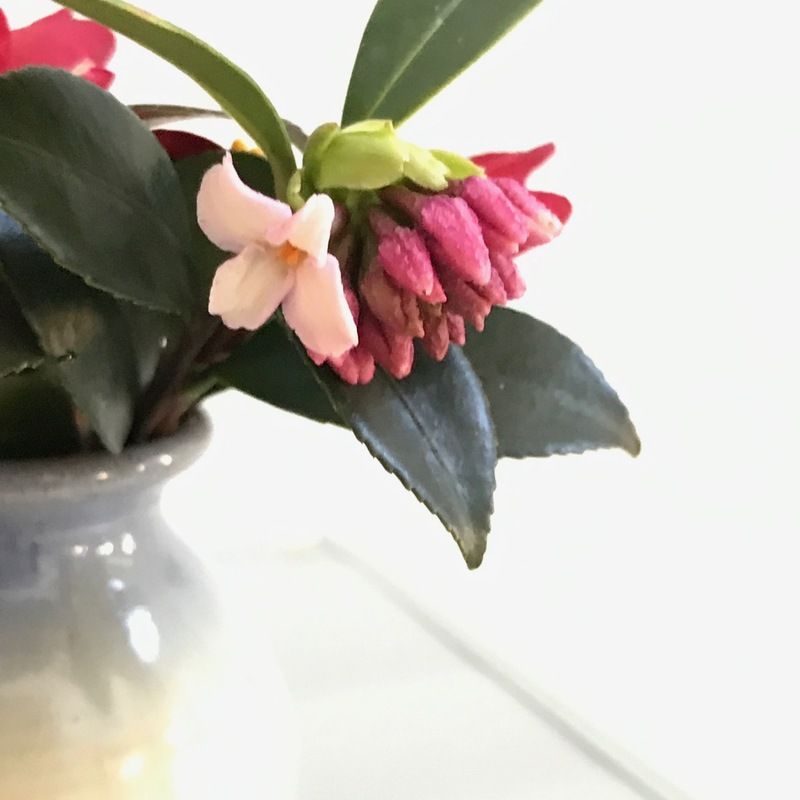 So excited to see and smell the first daphne flowers this week. I lost one shrub last year, but still have 2 that have grown together, making a nice impression near the front door. Hope yours brings you color and blooms soon. I hope your husband is on the mend by now. 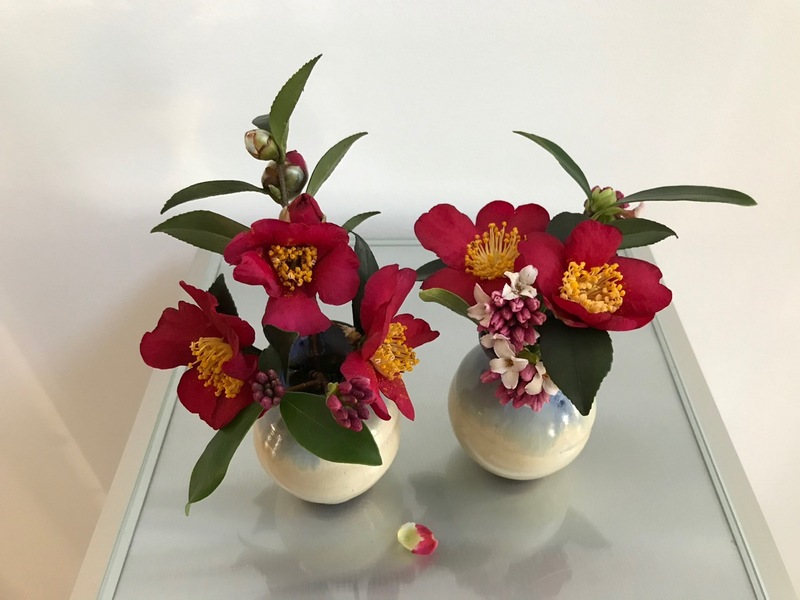 The camellia you have shown us is very striking and worthy of your very special vases. Thank you. ‘Yuletide’ has put on quite a show this year, beginning around November. It seems we’ve all gone small this week. Your little vases are very sweet. I’m excited that a Daphne I bought two years ago is about to flower for the first time! Oh, enjoy your Daphne, Alison. I hope to add a couple more to my garden this year. With such perfect blooms to gaze at, its no wonder you posted, even when you are all focused on supporting your husband. It’s helped having some family here. I had several other vases ready the past few weeks but couldn’t get time to post. Fun to get back in touch. Thanks Cathy. It’s nice to get back to flowers! Hope your Yuletide performs well for you. Those vases are very sweet. I don’t think I’ve seen Daphne before. I’ll have to see if it grows around here. Thank you. Daphne is a treasure, well worth the search. 2018 was a year of health issues here too. I have high hopes for a happy, healthy 2019 and will extend those hopes in your direction as well. Your little vases are precious and I especially like the effect of the fallen petal. Ricki, so sorry you’ve health issues as well to deal with. Thanks for your kind wishes and sending you mine in return. I’m sorry that you and your husband have been challenged by health issues, Susie, and I hope things will be on a more even footing this year. I’m sure time spent in the garden, constructing your beautiful arrangements, and doing yoga will restore your energy. Best wishes! Thank you Kris! It’s been stressful but things are easing and becoming more routine. Judy, thank you. I’m sending wishes for healing to you and your husband. I’m glad to know that your husband’s health is improving. It’s nice to have you back. I miss your beautiful flower arrangements and their lively photos. That’s so nice Pris, Thanks your the kind words. Lovely. You are so fortunate to have any blooms in January. I will have to wait until at least March for mine. Thanks for sharing the beauty with us here. Thanks Beth. There still are a few spots of red on the bushes, despite very cold temperatures this week. Ha! I shouldn’t even be saying that to you as I know your area is getting blasted with cold. Sweet! 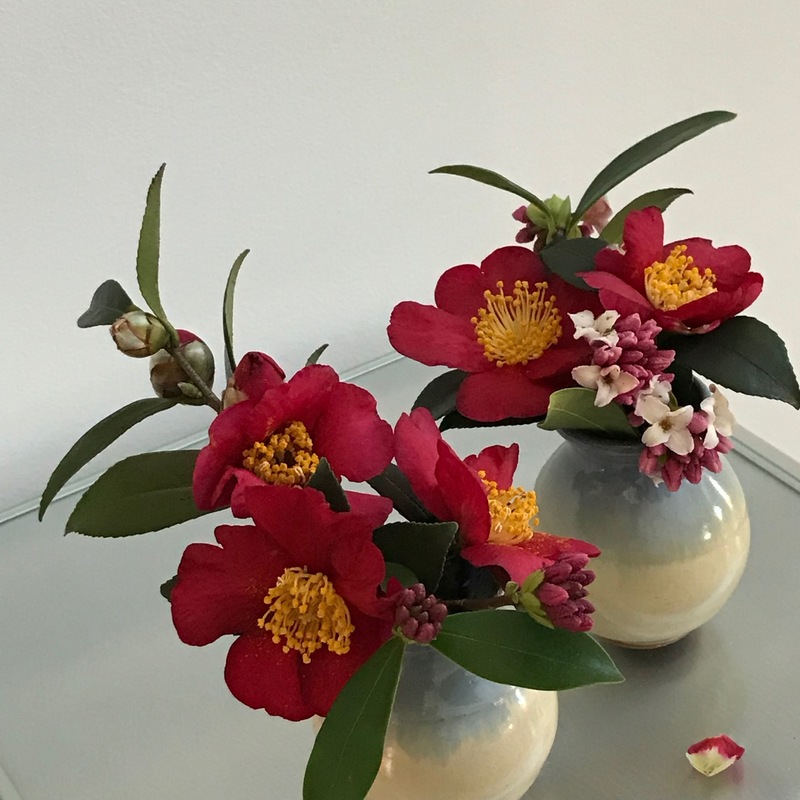 ‘Yuletide’ was one of our three most popular Camellia sasanqua (after ‘ShiShi Gashira and another that I can not remember). We grew the winter daphne as well, but it was not very popular, and did not do well for us. One of my three daphnes died unceremoniously last year. Will try to replace it soon. It was not my favorite crop. Our clients were always pleased to get them because they were so scarce; but I did not feel good about selling something that was potentially risky. Fortunately, most who reported back were still pleased with them. Pretty pair! The camellias are perfect! Thanks Eliza. This has been a stellar season for the late fall/early winter cameillias. Sorry to hear your husband has been unwell. What a worry. Nice to see you and your gorgeous camellia back. Yes, the vases are lovely. Nice to hear from you. Appreciate your concern. 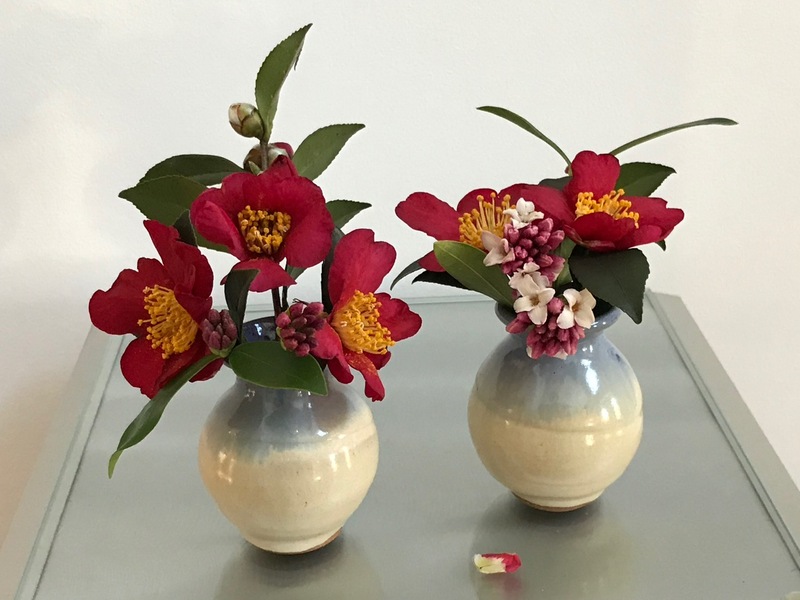 The camellia has been a splendid fall and winter companion. I’m so sorry I haven’t been in touch. I hope D is doing better now. I’m glad your daughter has been able to visit. 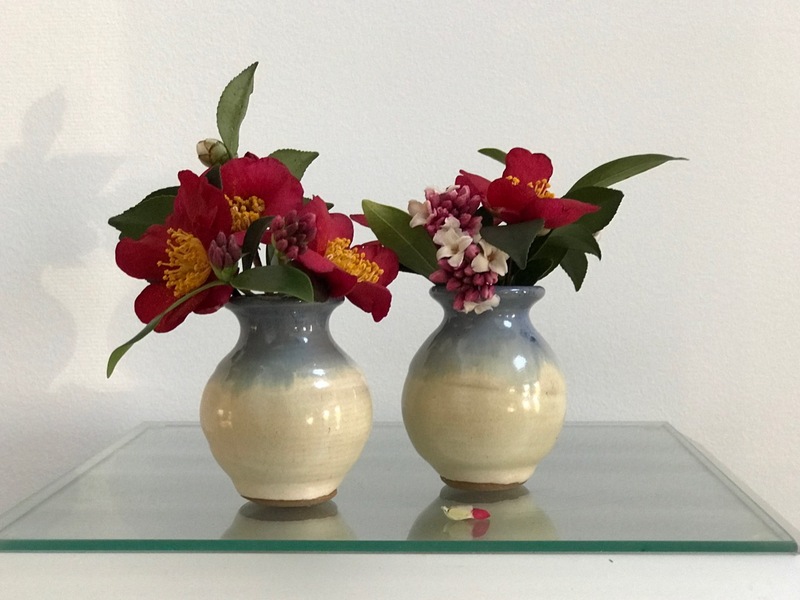 Your delightful little vases are gorgeous. Christina, thank you. Things are evening out, less stressful. I’ve meant to write you but it’s been hectic. Our daughter’s visit helped so much and we’re started to find ourselves on a more even keel. So pretty Susie. Love the vases. All the best to your husband and a happy new year to you both! Thank you Cathy for your good wishes! Thanks! Lasted pretty well too but had to give up the vases when my daughter left. I hope your husband feels better soon. I’d love to give those Daphnes a sniff! Thanks Jason. Things are settling down. 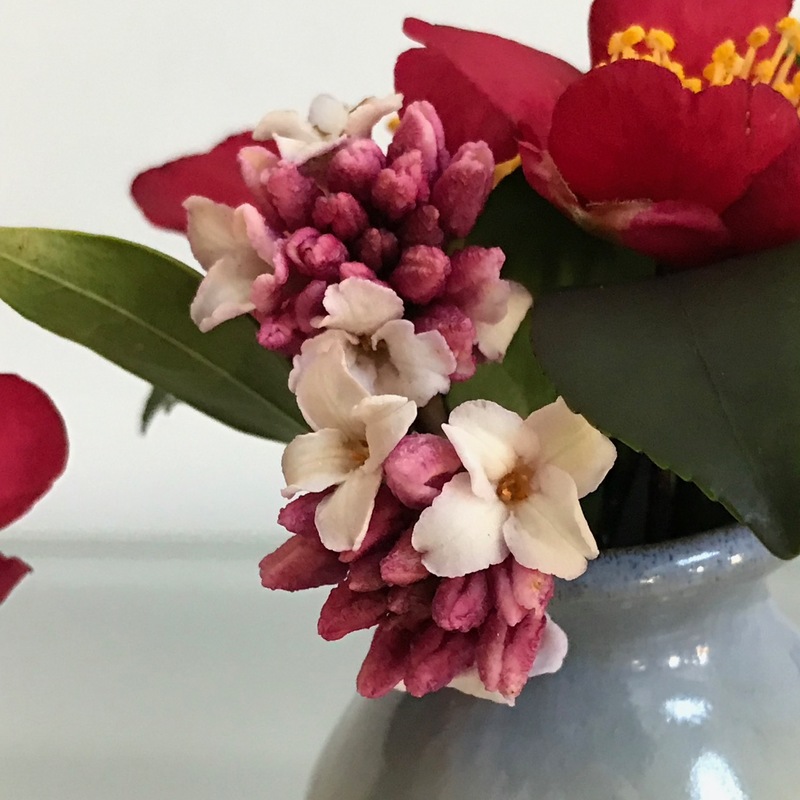 The Daphne does smell do fresh and lemony. We had a cold snap last week so it paused further blooming.